When you mention Arizona you think Grand Canyon but the real gems are the slot canyons near the town of Page. They are narrow gaps in the sandstone carved by flood water. When dry, they have such intense colour they glow. 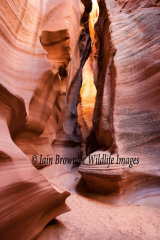 Antelope Canyon is the best known but can be busy. X Canyon is much quieter but needs a guide and off-road vehicle. You need the sun to be high to light the canyons well. While you are at Page check out the river at Big Bend. You will need a head for hight!